These factors may cause the spine to become curved and can be reversed. About 80 percent of scoliosis cases are idiopathic, meaning the cause is unknown. There is no research evidence that chiropractic treatment can cure idiopathic scoliosis. But Chiropractic treatment can help give relief for some of the pain caused by idiopathic scoliosis. That will help your child to stay active which is important for their general health and well-being. 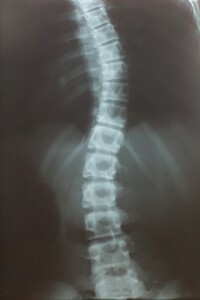 Adults who had scoliosis as children are more likely to have chronic back pain than people in the general population. Therefore, the most important thing is to detect the scoliosis in the first place, diagnose the cause of the scoliosis and then treat it appropriately. Most cases develop in children between the ages of 9 and 14 during the growth spurt of puberty. It affects more girls than boys with 80 percent of adolescent cases affecting girls. As the curvature gets worse, the spine tends to rotate. This can affect the ribs, which become prominent on one side. In severe cases of scoliosis, the rotated ribs may limit the amount of air getting to the lungs, putting strain on the heart. This increases the risk of heart failure in later life. This is why early diagnosis is important – appropriate treatment can prevent complications later in life.